Note that all rowing traffic is near the right bank relative to the direction of travel. So East side when heading upriver, and West side when heading down river. 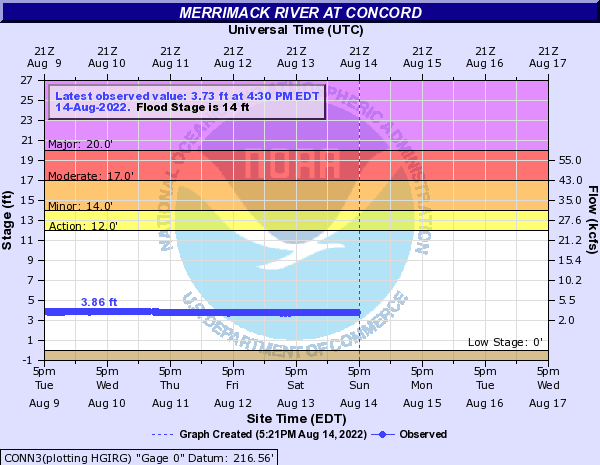 The below USGS graph shows the current and recent water level for the Merrimack River at Concord (Loudon Rd). The point of measurement is above the ARC stretch of river. The relationship between the graph and flows/levels in the ARC river stretch is not precise. The Garvin’s Falls hydroelectric plant at the north end of the ARC river stretch might cause some of the lower flows/levels in the ARC river stretch to vary independently from the levels shown on the graph. However this station is now operating in run-of-river mode (what comes in must go out) so these variations should not be extreme. The graph is primarily useful for determining how much and how fast the water level in the ARC river stretch is changing as a result of heavy rain and/or snow melt. The graph also provides an important measure of potential and actual flooding. The National Weather Service flood warning and flood stages are shown as lines on the graph when the river level approaches these elevations. For more information, visit the USGS website. The ramp at the boathouse has been marked with two white lines on either side to show the approximate water level at the ramp that corresponds to 10 feet on the Concord USGS gauge (linked from this site). 10 feet on this gauge is the Army Corps of Engineers Flood Warning Level. The ARC safety policy currently designates “at or above” 10 feet on the Concord Gauge as the elevation at which restrictions on river use go into effect. All ARC users should observe these markings and the safety rules that go into effect when the water is at or above either these markings or 10 feet as reported by the Concord gauge. The markings are only approximate. Water levels at the ramp can and will vary from the numbers reported by the gauge. Use judgment and interpret the markings conservatively.